Well I suppose since Charlie Beth turned ELEVEN months old last week, I should probably go ahead and get her ten month update published, don't you think? Whoops.. Ten months already? How is that even possible? Every month flies by a little quicker than the last and before we know it we will be celebrating your first birthday. Cue the tears! Speaking of your birthday, I have nailed down a theme for your party and have already begun the planning. I can't wait! You seem to be slowing down a bit on your growing. I think it's probably because you are constantly on the move so you're burning tons of calories. Seriously though, you never ever sit still! You're still in mostly 12-18 month clothes and size 3 diapers. Speaking of clothes, I've bought you a TON of new fall outfits to wear (Mama loves a good consignment sale!). Now if only the weather would cool down enough so you can wear them! You started walking last month as soon as you turned nine months old, and it's safe to say you have officially mastered walking around on those two feet of yours. You're everywhere and into everything these days! You have a way of finding the smallest piece of dirt, paper, whatever is laying on the ground and putting it straight into your mouth. You're keeping us on our toes these days, for sure! We can also add TALKING to your list of milestones. You said your very first word this month and it wasn't Mama... Your first word was Dada and your Daddy's face lights up every time you say it. You are turning into such a daddy's girl, and I can't wait to watch the relationship between the two of you grow even closer. You still have six teeth, and aren't showing signs of breaking anymore through anytime soon. Those teeth give us the best smiles and give you the opportunity to eat everything in site. You aren't a picky eater at all, in fact there are very few things you don't like. You aren't crazy about fruit, but you will eat any and every vegetable that's been offered. You're a huge fan of beans, peas, and anything with cheese at the moment. You are sleeping better, but sleep is always a work in progress with you, little one! You usually wake up 1-2 times a night and take 2 naps a day. You go down for your naps and bedtime in your crib so easy these days. You nurse as I rock you then I place you in your crib when you finish. You roll right over to your belly, stick that booty up in the air, and your out. I love seeing that booty sticking straight up in the air over the monitor! You're definitely a morning person and an early riser. Your wake up call is anywhere from 5:30-6:00am. Don't you think you could stretch that out just a littttttle longer? Unfortunately this month brought on your very first sickness ever! After a couple of days of cough and congestion I brought you to the doctor where you were diagnosed with your very first ear infection. We started antibiotics right away, but they didn't touch the infection. We went back the next week to learn that you now had a double ear infection and were given a new round of antibiotics. A couple of days later you started developing a terrible rash all over your body. It was then we discovered that not only were you dealing with a case of Roseola, but you are also allergic to sulfa drugs. That was a ROUGH couple of weeks. I wanted nothing more than to take the pain and sickness away from you. I hate seeing you hurt. Football season is just gearing up, and we have already managed to confuse the mess out of you when it comes to cheering for teams! Your Daddy insists you wear orange on Gamedays two cheer on the Vols and Mama instead on red for the Tide. You usually end up wearing at least two outfits every Saturday to please us both. I can't wait to see which side you eventually cling to (Roll Tide!). 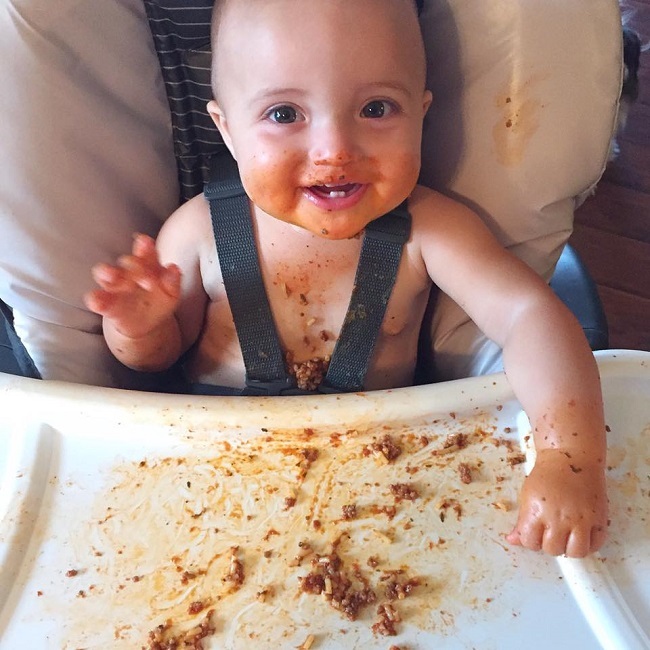 Some of your favorite things this month include: taking stroller walks around the block with mommy, walking around everywhere by yourself, pulling all the pots and pans out of the cabinets, taking baths in Mommy and Daddy's big Jacuzzi tub, and playing with the dog's bones. I still can't believe just how fast you are growing. I'm going to have a toddler in just a matter of weeks! You are so, so very loved, Charlie Beth. 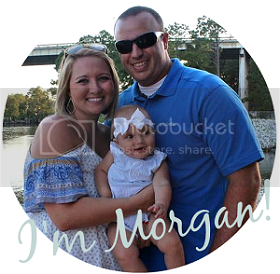 Mommy and Daddy are so blessed to be your parents and watch you grow. We started Charlie Beth on purees when she was around five months old, but she never really took to them. I spent hours buying fresh produce, cutting, steaming, pureeing and packaging her food, and some days she wouldn't eat more than a spoonful or two all day. She was quite content getting her nutrients from nursing, so I eventually gave up and let her take the lead. 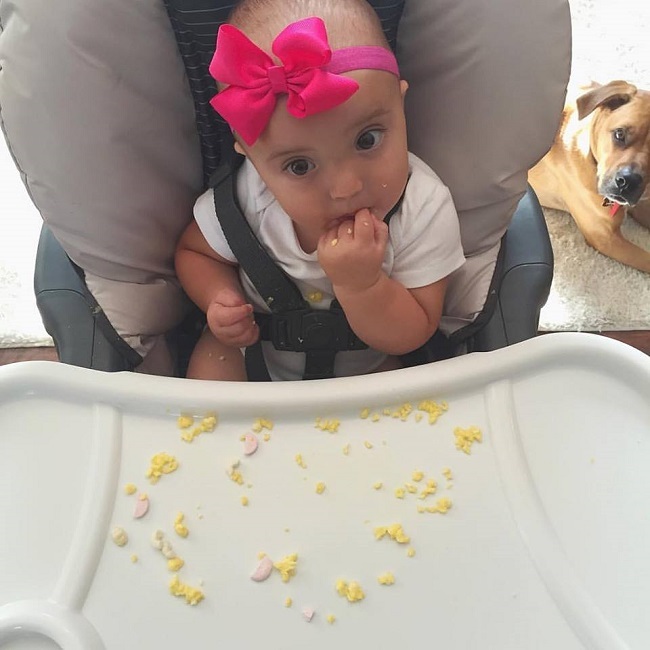 Right before she turned eight months she started to take interest in the foods that Steven and I would eat. I would try to give her spoonfuls of pureed food while we ate dinner, but she only wanted what we were eating. We started giving her tiny pieces of soft foods, and she was hooked on table foods from then on out. I was so glad that she was finally taking an interest in foods, but I also had intense anxiety over choking. Poor Charlie Beth could barely pick up her food and put it in her mouth because I cut everything into such small pieces. I knew that I would eventually have to start giving her bigger bites, so I began researching foods that she would have the easiest time chewing and swallowing. After a couple of weeks we progressed onto new flavors and textures. Now, at ten months old, Charlie Beth is eating basically everything that Steven and I eat. I'm constantly amazed at how much her meals resemble that of a child's meal. Where did my tiny baby go?! **Talk to your pediatrician before introducing your baby to known allergens such as eggs and nuts. As you can see, there is a lot of variety in the foods that Charlie Beth eats on a daily basis. There really isn't much that we eat that we don't let her have. That being said, Steven and I have really had to clean up our diet. It's important to me that Charlie Beth gets wholesome and, whenever possible, organic foods. I believe it's imperative that we start healthy eating habits now so that they will hopefully carry on with her for the rest of her life. That being said, I'm thankful to have products like Annie's Homegrown easily accessible at my local grocery store. As a busy mom, I don't have time to drive all over town just to buy groceries. Annie's Homegrown helps our family to eat better and live more responsibly without having to sacrifice taste. 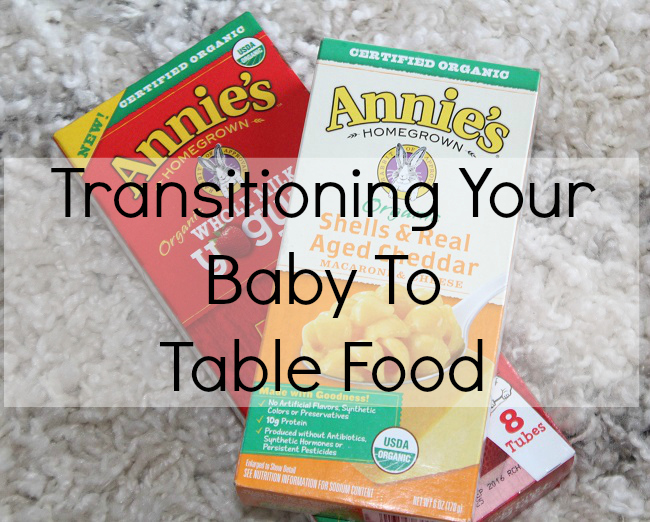 Are you ready to start your little one on table foods? Head to your local grocery store and try Annie's Homegrown products for yourself. Last Saturday evening my mom and I had the opportunity to sneak away for a girl's night and attend a wine tasting at Fleming's Steakhouse. We had a blast tasting bottles we had never had, sipping on some old favorites, and enjoying some delicious hor d'oeuvres. 50 of the 100 wines that Fleming's offers by the glass were uncorked for the night, so the options were endless. We stuck with tasting mainly whites, but the reds looked just as delicious. It was such a fun night out with my mom! Fleming's has been a family favorite of ours since they opened a restaurant in Birmingham several years ago. Steven and I celebrated our first anniversary at Fleming's last year, and it is one of our favorite places to go for birthday dinners. However, Fleming's isn't just for celebratory dinners. They also have a fantastic happy hour. I love meeting up with girlfriend's for happy hour drinks and small plates. We always have the best time catching up and sipping on wine! One of my favorite things about Fleming's is there wine menu. The choices are endless! I love that the wine menu is presented on a tablet. With so many options it's easy to get overwhelmed, but their virtual wine list is easy to navigate and read. Steven isn't a big wine fan, but he is a huge fan of their steaks. Talk about delicious! We have never had a meal at Fleming's that we haven't loved. My mouth is watering just thinking about the menu! Do you have a Fleming's Steakhouse near you? Fleming's would like to give one lucky reader the chance to win a $100 gift card to their restaurant. Enter below for your chance to win. Good luck! 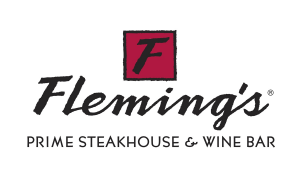 Thank you Fleming's Steakhouse for hosting my mom and I at the One Summer Wine Tasting Event and for sponsoring this post and giveaway. As always, all reviews and opinions are my own. These days it seems like every month goes by a little bit quicker than the month before. The more I will time to slow down, the faster you seem to be growing up. The other day I caught myself looking through my phone at pictures from your first few weeks of life. You were so tiny! While I miss seeing you that little, I absolutely love watching you grow and learn every day. I'm amazed by you every single day. We had your nine month well visit at the doctor's office this week. You weigh 21.3 lbs (75%) and are standing so very tall at 29.5 inches (95%). You get that height from your daddy! You are wearing anything from 12 to 18 months and are still in size 3 diapers. You're growing by the minute, kid! 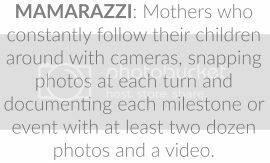 This was certainly a month of milestones, and you hit a huge one right before you turned 9 months. The week before we celebrated your ninth month of life you took your first steps! We were at your Nana and Papa's lake house visiting with family when you decided to show off your skills for the first time. I caught it on camera, and I'm so happy that I did! I can't believe my little baby is already WALKING! You spent a ton of time at the lake this month visiting family. You even met some of your family for the first time! We had so much fun making lifelong memories with your aunts, uncles, and cousins. You, little girl, are already such a lake girl! I can't wait to watch you grow up on the water. If you Daddy has his way, you're going to be skiing by the age of three. We've made some strides in the sleep department. Although you still wake up 3-5 times a night, you are now officially sleeping in your own crib! It was such a hard transition to get you to fall asleep in your crib, but with some hard work and persistence, we did it. Next stop, sleeping through the night! You actually did sleep through the night for the first time ever a few weeks ago. I was crossing my fingers and toes that you had finally turned that corner, but no such luck. We'll get there one day! Mama may be exhausted now, but I know I'll miss these days when they are over. Some of your favorite things this month include: playing with your dogs, walking around the house holding onto mommy's hand, playing with your toys in your playroom, making a mess, napping in your car seat, getting into anything and everything. You are one of a kind, Charlie Beth, and Mommy and Daddy are so blessed to call you our little girl. We love you more than you'll ever know! Please don't grow up so fast, ok?